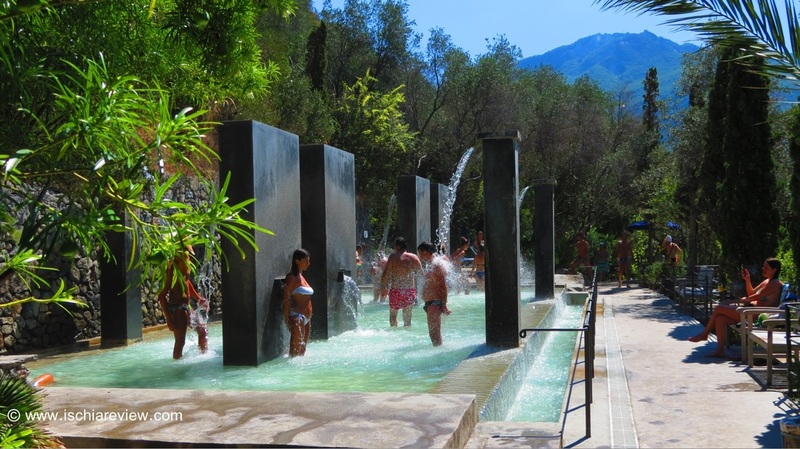 Article about Negombo Thermal Gardens in Ischia explaining the origins of the park and the potential healing benefits of its thermal water. Ischia is world-famous for its volcanic activity that creates a wide-range of health benefits to those who visit the island, and Negombo is at the forefront of the island’s special relationship with nature, and in particular, with water. With more than 50 years of history in the realm of hydrotherapy treatments, Negombo has evolved and increased its understanding of the volcanic activity that rages deep within the bowels of the earth below, creating a centre of wellness excellence that has few, if any, peers. For more than two thousand years, dating back to the times of the first Roman settlers on the island, Ischia has been the subject of intense speculation and discussion, due to its very particular and unique geological composition. In fact, it was the Romans who first started to analyse and understand the health and relaxation benefits of Ischia’s thermal water by constructing public baths in which to bathe and temples from which to venerate their gods, such was the respect given to this natural wonder. Through the ages, science has gained greater knowledge of the thermal water and it is now a recognized source of medical remedy for many common ailments. To this day, governments of major European countries such as Germany, along with Italy which is home to Negombo, send patients to Ischia with financial grants in order that they can be treated for a range of diseases and ailments such as arthritis, rheumatoid conditions and dermatological complaints. With the health benefits of Ischia’s thermal water well-documented and by now well-established, Negombo is the hub within which visitors can enjoy the full repertoire of wellness treatments while surrounded by a hugely relaxing environment. Indeed, with so much emphasis given to the water and its healing properties, it would be easy for an uninitiated visitor to Negombo to be unaware of the stunning location and landscapes of the gardens, but it is these extra elements that tie everything together to create a feeling of contentment as soon as the first steps within the complex are taken. Ermanno Casasco is a landscape architect of worldwide renown with a legacy of spectacular gardens and landscapes in every corner of the globe, and in particular in his home country of Italy. Since 1988, Casasco has been tirelessly working on the gardens, in order to bring to life the original plans of the Camerini family who first devised and developed the idea of Negombo in its formative years. Casasco’s work around the garden is nothing short of stunning. Given a blank canvas and a directive to set his imagination free, he has created many unique works of water-feature art such as waterfalls, cascades and perhaps most notably the “Templars”, a set of black marble monoliths which flow relentlessly with the health-giving water for visitors to soak under. The concept of Negombo was originally devised and developed between 1947 and 1960 by Luigi Silvestro Camerini and has stayed within the Ducal family until this day. Camerini in his day was a traveller, humanist and student of the Orient who was inspired by his experiences to create the original botanical gardens of Negombo. He started by creating an ingenious system of irrigation based on pools and vats for gathering rain-water and also traced out paths that climbed the cliffs of Mount Vico next to the gardens by cutting steps in to the rock. The Cycas, Zamia and Ficus trees that Camerini imported at great expense and with great difficulty, can still be seen in the gardens today and are an important reminder to his work and the gardens origins. It was also in those formative years that the site was given its name which still stands today. On one of his many travels around the globe and particularly the Orient, Camerini found a beautiful bay in Sri Lanka (Ceylon in those days) and was so taken with it that he decided to name the site in its honour. Thermal parks & gardens are abundant in Ischia and as such there is a great deal of knowledge and advice given on how to best enjoy them or to take advantage of the health benefits. However, at Negombo, you are simply advised to enjoy the park in any way which you feel best suits you, recognizing that you are an individual with a myriad of complexities and with no strict program that you must follow although useful advice and explanation about each pool or hydrotherapy treatment is available in written form and also by asking for help from the many assistants who work at the complex. This respect for individuality can also be felt in other aspects of the park such as the unique sculptures and works of art that can be found around the complex. Arnaldo Pomodoro is an Italian sculptor known for his eye-catching and at times, controversial work. One of the first things a new visitor to Negombo will see is his “Arc en Ciel”, a giant archway ten metres wide at its base and five metres in height. The arch is decorated with symbols which represent a passage through time and reflection, marking a poignant symbol of Negombo’s purpose. The landscaped gardens of Negombo are beautiful and with more than 500 varieties of plant-life on display, the vibrant colours and shades that can be found around every new corner are enough to make a walk around the park an enjoyable day out but the real beauty of Negombo can be found in its water. There are twelve different pools to choose from in the complex, each with their own characteristics and purpose. One of the most interesting is the Japanese Labyrinth Bath, designed to soothe and heal the feet and lower limbs. By walking through two separate pools, one with a hot temperature of 38° Celcius, and the other one cold at just 18°C, the venous and lymphatic systems are treated to a natural massage from the pebbles that line the bottom of each pool with 5 laps of each pool said to give the optimum benefit. Similar to the Japanese pool is the Kneipp bath which uses the same two temperatures to stimulate circulation and improve muscle-tone. The largest pool at Negombo is the Olympic-sized sea-water pool measuring 33 metres in length and 15 metres in width. A common feature at Negombo is the view from which you can relax and enjoy the thermal water and there is nowhere on the complex where that is more greatly felt than at the seawater pool as it looks directly out on to the beach in the beautiful bay of San Montano, which can also be accessed from the park. Each pool has been meticulously landscaped to give it an air of individuality and with the varying water temperatures it’s easy to distinguish between each one. One of the most relaxing areas of the park is the Onphalos grotto, a cave carved out of Ischia’s special tufa stone. The cave, 12 metres deep and 4 metres high comprises a warm relaxation pool, a sauna cave, a cold water well and a deep-plunge thermal pool with seats and hydro-massage jets outside designed to stimulate relaxation of mind and body. The complex is also home to a technically-advanced wellness centre with a modern range of massage therapies available from their qualified staff. It is difficult to describe Negombo in just a few words as it offers such a diverse range of attractions, centred around the ethos of wellness of mind and body. Whether it’s the individuality of the artwork and the landscapes, the beautiful array of flowers and plant-life or simply the enticement of a day relaxing in the beneficial thermal water, perhaps the real beauty of Negombo lies in its ability to combine all of these elements to create a truly unique experience. Negombo Thermal Gardens is one of the prime visitor attractions and as you've just read in the above article, a must-visit if you're planning to come to Ischia. Our Negombo visitor information page gives you all of the details about when you can visit, daily opening-times and ticket prices.